A 60 years long experience helping you to better work with safety. 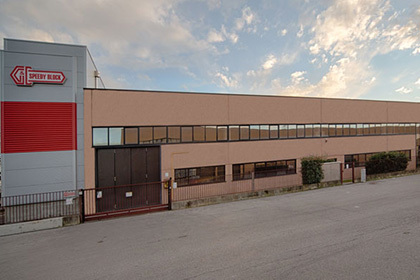 Since 1948 Speedy Block company has been actively present on the Italian and international markets with the activities of studying, designing, developing, producing and trading toggle clamps. 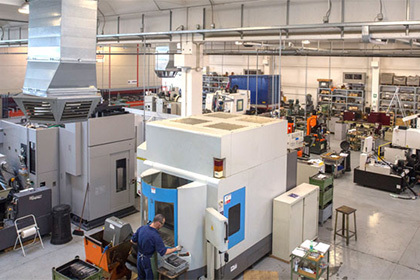 All productive phases, ranging from product planning to sales, are accomplished with the help of the mostly advanced technology and by the implementation of procedures, processes and controls of proven effectiveness and based on long experience. We are a modern, dynamic company turned to the renewal. 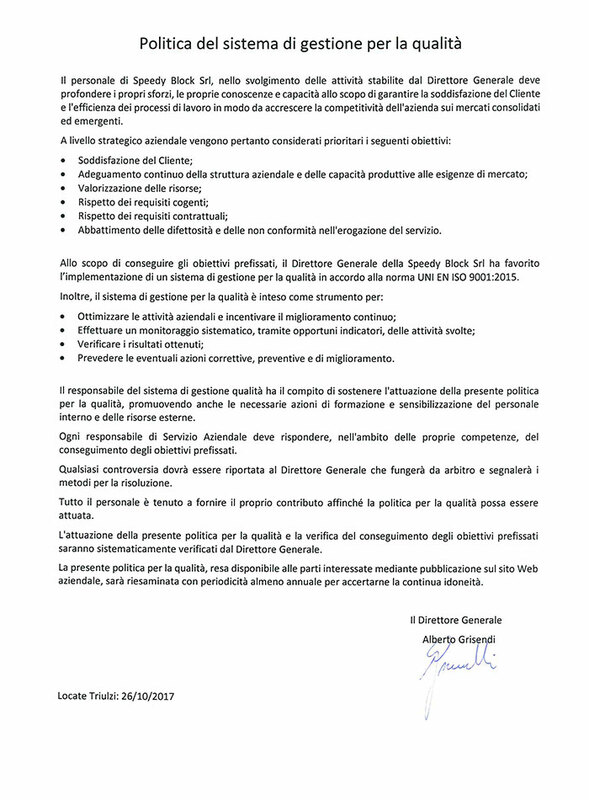 We count on quality as safety guarantee for the most exigent customers.We are a â€œlearning organizationâ€ with the will to do well what we are able to, and improving more our products. 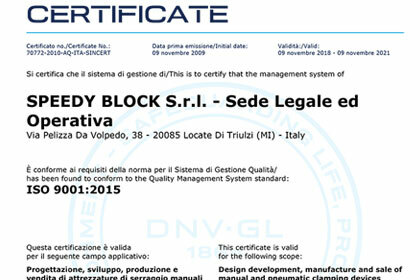 SPEEDY BLOCK Srl is conforms to the quality management systems standard. 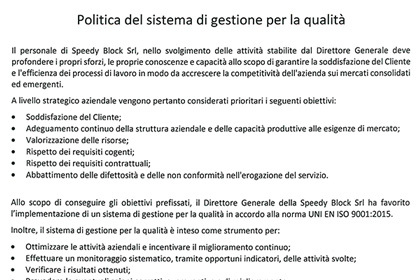 The SPEEDY BLOCK quality system is UNI EN ISO 9001 and this certificate is valid for the following products or services: design and production of manual and pneumatic clamping devices. 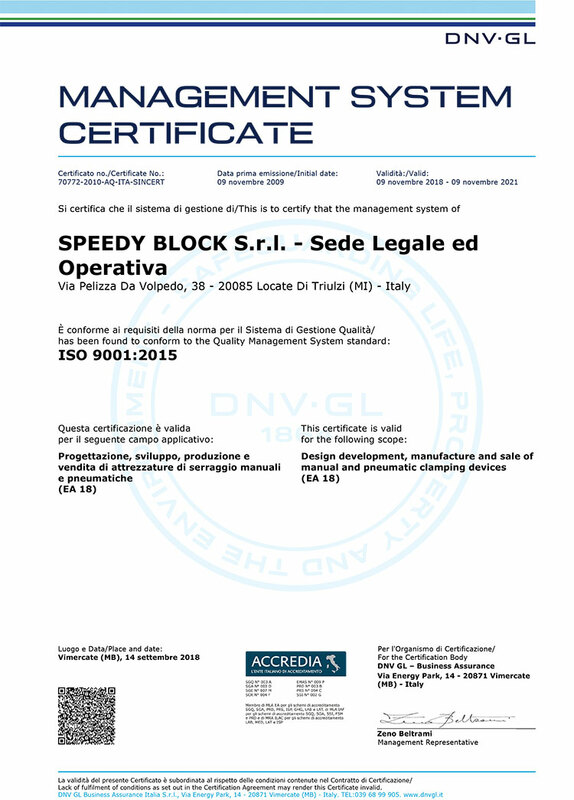 We hereby certify under our sole reponsability that all the products supplied by SPEEDY BLOCK have been inspected and tested in accordance with the procedures of the quality system (UNI EN ISO 9001) certified by DNV (Det Norske Veritas) and the condition and requirements of the confirmation of order, conform in all respect to the specifications contained in our catalogue.